The date of its origination is debatable, but the ‘Westbury’ White Horse is considered one of the oldest of the Wiltshire white horses. It is also one of the best situated, being high on a very steep slope and overlooking a marvellous panoramic view. Surrounded by idyllic countryside, it is a favourite spot for picnics, walking, kite flying, hang gliding and para gliding. There has been a white horse on the site for at least three hundred years. Local records from 1742 suggest that the horse was originally cut in the late 1600s, probably to commemorate the Battle of Ethandun, thought to have possibly taken place at Bratton Camp in AD 878. Cut into the chalk, the horse originally had to be scoured regularly to keep it white. The last recorded scouring took place in 1853 but in the late 1950s, the horse was “preserved” by covering it in white-painted concrete which was repeated in 1995. The concrete has a tendency to become discoloured through weathering so the town council is undertaking a regular programme of maintenance to keep the White Horse white! 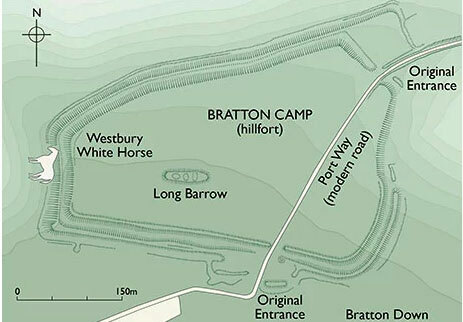 Next to the White Horse is Bratton Camp. The earthwork defences of an Iron Age fort were built at Bratton Camp over 2,000 years ago. Bratton Down is designated a Site of Special Scientific Interest (SSSI). The extensive area of chalk grassland supports herb and grass species that provide a habitat for a diverse assemblage of insects, including the rare Adonis Blue butterfly and the scarce Forester Foth.